Whether you’re looking for a venue to host a corporate team building event, a vacation with the family or a get-away golfing holiday with friends you can’t go far wrong with a golf trip to the French Riviera in the South of France. There are about 20 wonderful golf courses in the south of France, just a stones throw from wonderful villages and towns such as Cannes, Antibes, Valbonne, Mougins and Aix en Provence. Plus, with the added benefit of easy access to the region via Nice International airport or the hi-speed TGV, it couldn’t be easier to hit the fairways on the French Riviera! The ability to intersperse a game of golf with some culture, gastronomic and liquid delights puts Golf in the South of France way ahead of the more traditional destinations such as Portugal and the Costa Brava. From beginners to those looking to tackle championship golf courses, the South of France and its many courses are ready and waiting. World renowned and championship golf courses in the South of France include Cannes Mougins, Royal Mougins, Taulane designed by Gary Player, La Grande Motte, Four Seasons, Barbaroux, Saint Endreol, Gassin, Fregate, Saint Donat designed by one of the worlds most prolific course designers Trent Jones snr, Pont Royal and Nimes Campagne. With more than a dozen enthralling 18 hole golf courses on the French Riviera, all you need to think about is accommodation. Buying a villa in the south of France close to a golf course is a great choice if you fancy a bit more freedom than a traditional hotel can offer, plus it can indeed be far better value in the long run. Dependent on the number of people in your golf party there are many beautiful and magnificent villas to choose from. If there are non-golfing partners, the location of the rental villa is important too, because whilst the golfers are spoiling a nice walk in the country, the other members of the party will want to have easy access to other locations of interest and the major towns in the areas such as Cannes, Antibes, Mougins and Nice. Choosing the time of year is also an important factor for your golfing trip to the French Riviera. The region regularly enjoys temperatures of over 30ºC during July and August, and when you add in the number of tourists – these are probably the months to miss. Spring or late September are perfect! The day time temperatures are in the early 20’s, evening temperatures are mild (requiring a light jumper perhaps) and you’ll find plenty of freedom on the fairways. Plus, when visiting the other cultural delights the South of France has to offer you won’t be battling against the throngs of tourists present in July and August. The weather is a serious bonus in the South of France and an important element for your golfing trip – the area can boast 300 days of sunshine a year ensuring year round golfing opportunities. Travel to your golf holiday in the South of France and rental villa is quick and easy. Nice International airport is efficient and well connected to all the major hubs and city airports in Europe. The airport is well serviced and a pure delight to travel in and out of. Another option if time is on your side is the TGV. A regular service from Paris, the TGV has great connections and can be a very pleasant way to travel down to the South of France en-route to your favourite golf courses. Last but not least the ‘aprés golf’ will not let you down. With Cannes, Antibes or Nice offering you gastronomic delights and entertainment abound. While if you’re looking for a slightly quieter aprés golf experience the villages of Valbonne, Mougins or Biot can offer their own spectacular gastronomic and lively village experiences. So, what are you waiting for? 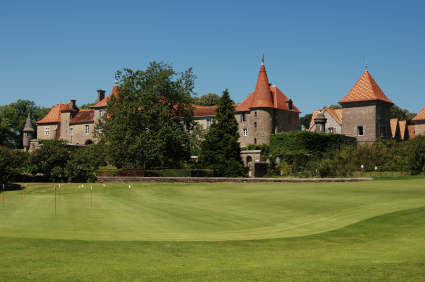 Start planning that golfing trip to the South of France now!